I had the great privelage of meeting Joanne Harris for the 3rd time in my life and this time it was on a passion close to my heart - norse gods! 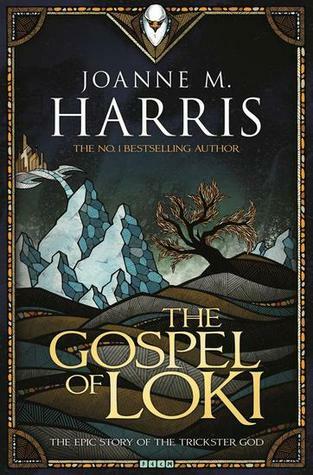 It was at her Gospel of Loki launch event as part of the Jorvik Viking Festival 2014. She told a fascinating and very charming tale of her childhood and how she would spend hours in the Library reading books on the norse gods, in what her then librarian deems the adult section. There was one book in particular that she fell in love with and when many years later she bought a copy online she found it was the very same book! How fab is that! Almost an omen from the Gods telling her to keep writing her fantastic tales about them - or in particular Loki. Before I start raving about how much I enjoyed this book let me make a few things clear. You DO NOT have to have read Runemarks or Runelight to read the Gospel of Loki. You DO NOT have to know much of anything about the Norse Gods to read the Gospel of Loki. This is a RETELLING, some could even say Joanne Harri's own version, of the myths, legends and sagas of the Norse Gods. Nearly every written record of said myths, legends and sagas of the Norse Gods are retellings to some degree because the originals were all oral. YES IT IS ALL FROM LOKI's point of view. NO THIS IS NOT THE SAME LOKI AS MARVEL COMICS. There are thankfully NO YELLOW HORNED HELMETS OR GREEN SUITS IN SIGHT. Is he as good as Tom Hiddleston's characterisation? YES IT MOST DEFINITELY IS. And to quote this particular Trickster's words 'not only that good, I am that much better'. Or something to that effect.